If you've already done Disney World and Orlando or just aren't into crowds but want to vacation in Florida, two Florida destinations worth considering are St. Augustine on the east coast and Sarasota on the west coast. Sarasota is located on the Gulf of Mexico between Manatee County (north) and Charlotte County (south). (Sarasota Florida map) With a year round average temperature of 72.6 F (22.6 C) and an annual high temperature of 82.8 F (28.2 C), Sarasota weather makes it a perfect winter vacation destination. It's not easy to compare Sarasota with other Florida destinations. Sarasota is considered Florida's Cultural Coast, with a bevy of professional theaters, professional symphonies, ballet and opera. Sarasota is home to more than 30 art galleries, artist communities, Florida's only designated state museum, The John and Mable Ringling Museum of Art, and a purple, shell-shaped performing arts hall, known for its excellent acoustics and unique architectural design (the Van Wezel Performing Arts Hall) � all of which complement the area's beautiful beaches and warm waters of the Gulf of Mexico. No need to leave Fluffy or Fido at home - Sarasota offers pet-friendly accommodations and parks so you can include that four-legged member of your family. With more than 30 different accommodations throughout Sarasota County offering pet accommodations, Sarasota is truly a pet friendly destination. What's more, Sarasota and Venice offer dog-friendly parks where your pets can stretch their legs and run for acres. Downtown Sarasota offers small-town Americana on Main Street, while the art galleries on Palm Avenue remind you of New York and L.A. Turn the corner onto Pineapple Avenue and you'll find fine antiques to true 1950s Florida kitsch. 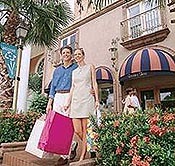 For gift shopping in Sarasota, explore the uniqueness of St. Armands Circle with its collection of upscale shops and specialty stores. Sarasota is known for its restaurants. Choose between American, Amish, Asian, Caf�/Deli, Continental, Italian, Seafood and Spanish/Peruvian. Rub elbows with locals while downing cold brews and munching big juicy burgers in the '50s feel of open-air diners. Amish restaurants serve heaping portions of comfort food, and French bakeries tempt with delicate pastries. Copyright � 2004 World Travel Guide .com. All rights reserved worldwide. Web Design & Marketing by Blue Cat Design Inc.